I wouldn't miss her as much. Some for the same reasons that I have missed her for 19 years. I miss her in ways that I never knew I would. What to do with a teenage son? How the manage teaching & home stuff? How did she cope at 38? I have spent this day with my brother in California. Being with him made this day WAY easier. Kari, I am so sorry that you lost your mother and at such a young age. What a bittersweet celebration the Fourth is for you. My thoughts and prayers are with you and I know your mom would be very proud of you and your beautiful boys! Wow. Something I did not know about you. I know she would be proud of the woman you turned out to be. ILY, Kari-girl! My dear sweet Kari! How I loved reading your blog about your mom. 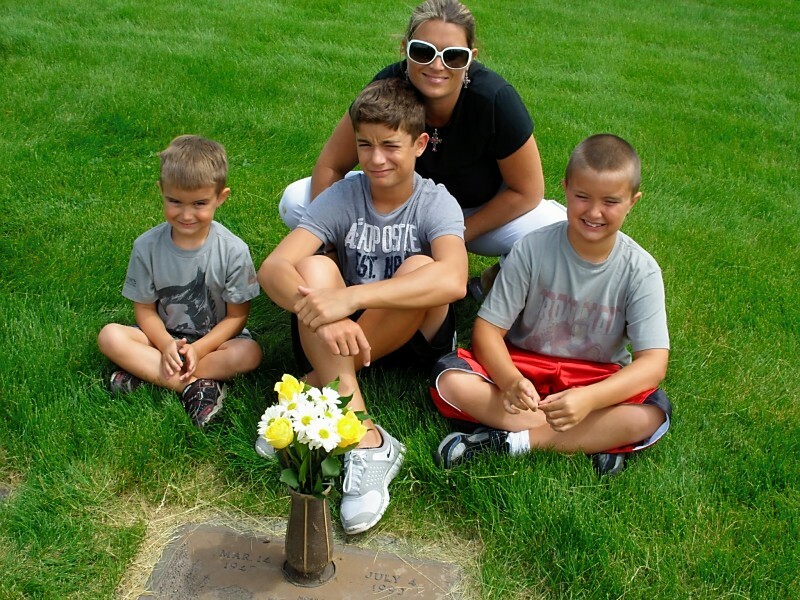 What a tender photo of you and your boys at your moms gravesite. Just makes me so very sad. As, I read your blog sooo many memories flooded back to that day that time 19 years ago. I cannot believe it has been 19 years. I can see your mom so clearly in my minds eye. I can see your moms fingernails, her hair, her skin color, even her front teeth. I remember her so clearly. Over the years I have been truly amazed and inspired by how you have trudged through the pain of this life and forged a life of peace and happiness. I really do love you and thinking about you not having your mom all of these years makes me want to sit down and ball. You are courageous my friend. Thank You for sharing your heart. Love You!